The 492 is one of those now-rare London services to operate to a half-hourly or lower frequency using double deckers. Buses run every 30 minutes during the day, with an hourly evening service. Usually routes with this sort of service level get increases, coupled with conversion to single deck operation to help fund the increase, but a handful of cross-border routes have had no such benefits, perhaps because funding is needed, but not forthcoming, to improve the section outside London. It has also been suggested that even if the frequency were to be increased, double deckers would still be required to cope with school movements. The route also serves an unusual mixture of operating territory. The oldest surviving section goes back to when it was introduced in 1975 by London Country (hence the 4xx series number), and is between Sidcup and the village of Bexley via Foots Cray and the sparsely populated North Cray Road, which was previously served by LC’s 467. 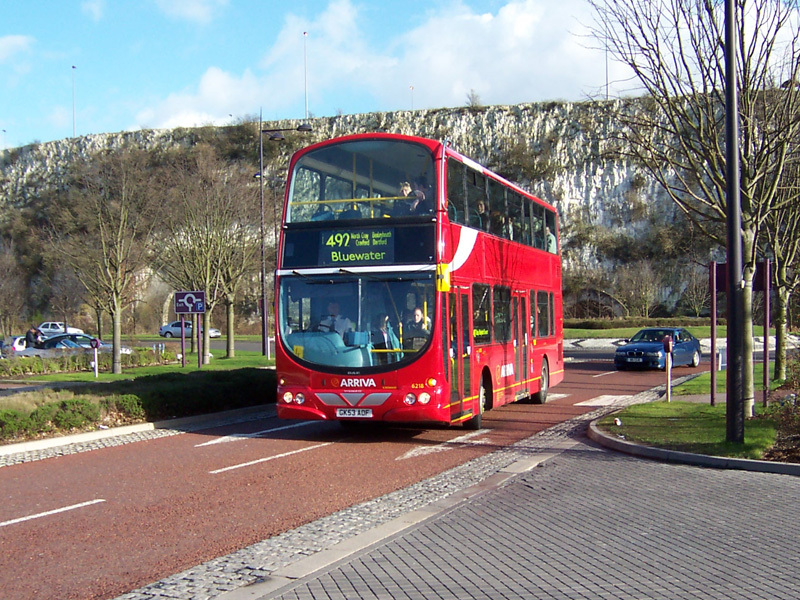 The route carries on to Dartford via local roads, and then continues to the Bluewater shopping centre. Although Dartford was served from the outset, the intermediate routing followed has changed several times. The old route was via Bourne Road, Crayford, Crayford Way and Burnham Road, now largely unserved. The 492 thus missed Bexleyheath, which was rectified in 1979 by diverting it via via Northall Road, Thames Road and Burnham Road. Meanwhile, the present routing via Mayplace Road, Crayford, Chastilian Road and Shepherds Lane was covered by the 486 (Belvedere to Dartford/Joyce Green). Beyond Dartford, the 492 originally and for many years ran to Horton Kirby. The controversial new Dartford area network introduced by Kentish Bus, successors to LC, in late 1987 involved the abandonment of the London sections of the 486 and 492, as well as the traditional 4xx series numbers. The 492 number was adopted by London Transport for one of its replacement services, following the existing route between Sidcup and Bexleyheath, and then taking the 486 route to Dartford, instead of the old route to Dartford and Horton Kirby. Selkent’s Bexleybus was the original operator, but after just a year the route passed to Boro'line Maidstone, who used four ex-LT Leyland Nationals, followed by new Lynx from 1991. But in February 1992, following financial difficulties, that operator sold out to none other than Kentish Bus! Further tendering saw the route return to operate from Bexleyheath garage in January 1999, though in the meantime that garage had closed and re-opened as a London Central base. Interestingly, this new award called for double deckers, due to the pending extension to the new Bluewater Park shopping complex, which occurred two months later, and was expected to generate heavy loadings. Initially, elderly Titans were used, but some single door Volvo Olympians were cascaded from route D1 towards the end of that year. 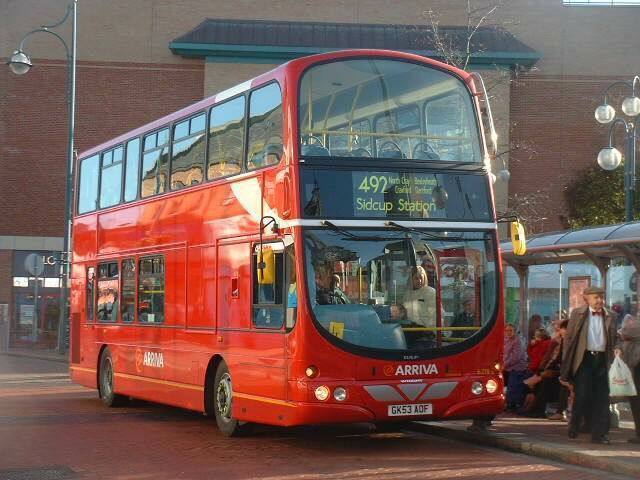 Upon re-tendering – with a requirement for new low floor buses – London Central lost the 492 to none other than Arriva, so the route returns to operate from Dartford garage for the third time! 7 VDL DB250LF/Wright Pulsar Gemini were taken from a blanket order for 50 for Arriva’s London operations, although Dartford remains a Kent Thameside garage. Two views of 6218 (GK53 AOF) on the first day of Arriva operation, 24 January 2004, at Bluewater (above) and in Bexleyheath.